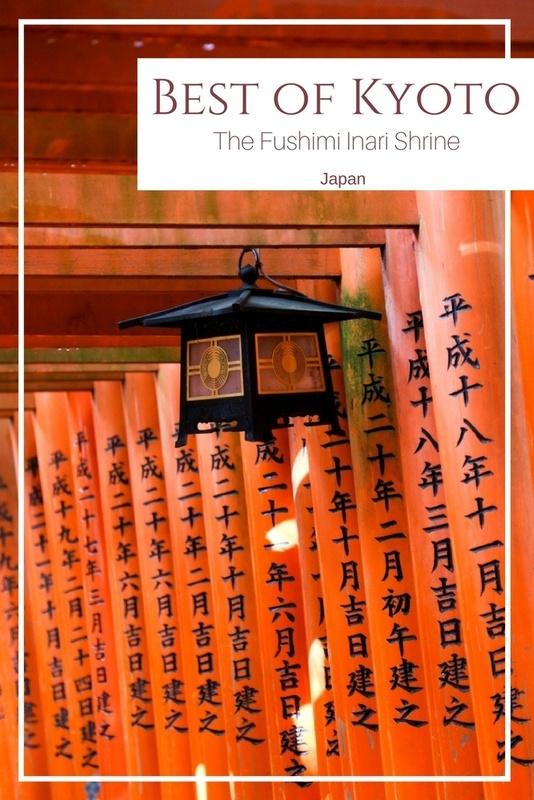 Have you been to the Fushimi Inari Shrine? Do you have any tips to share? The old capital of Japan, Kyoto is a fascinating city of old imperial sites and even older temples and shrines. 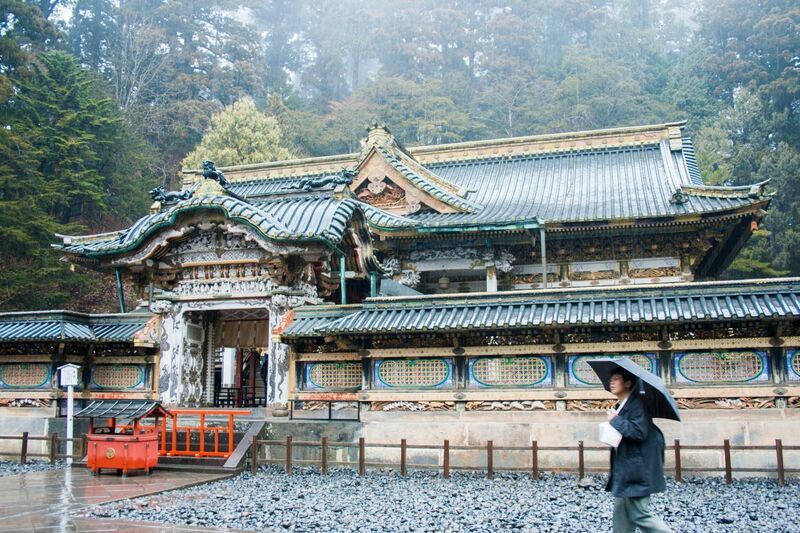 You can easily spend a week exploring all of the important sites, tracking Geishas, and soaking in hot spring water. The shrines and temples range from the spectacular and flamboyant Golden Pavillion to the whimsical and bizarre Otagi Nenbutsu. 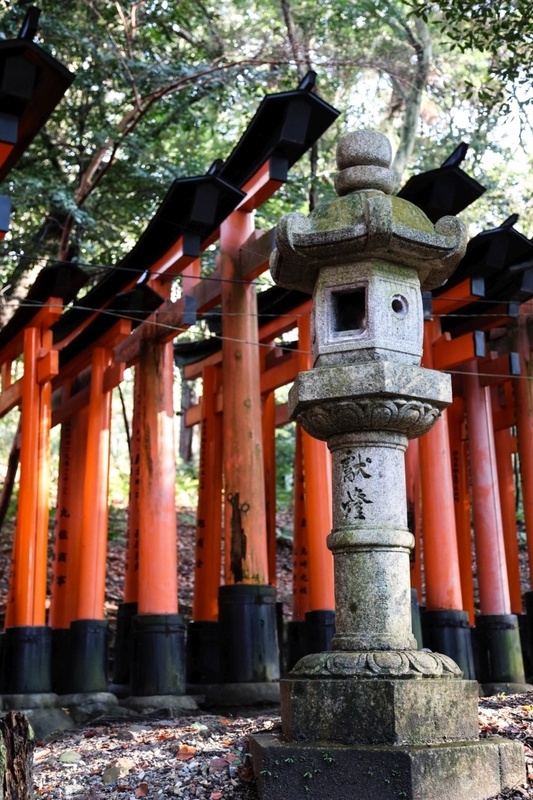 Arguably, the Fushimi Inari Shrine is probably the most iconic shrine in Kyoto. The bright orange gates winding through a crisp green forest act like a tourist magnet. Travelers and locals alike clamber for a break in the sea of people to try and capture their visit, but don’t let this stop you. 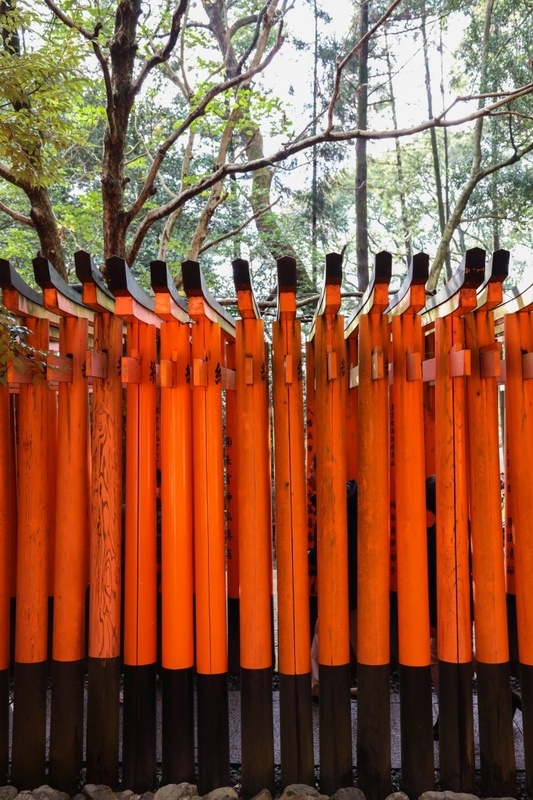 It is well worth spending at least half a day wandering the paths and collecting your luck as you pass through the bright orange torii gates. 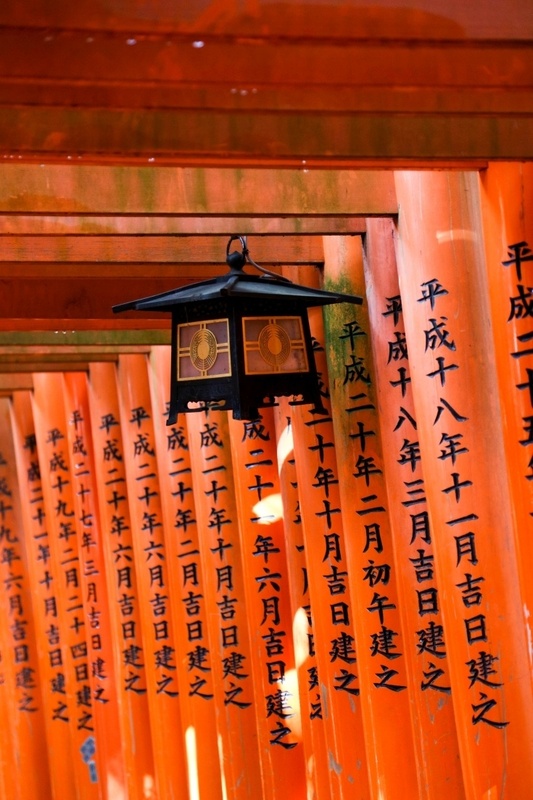 The Fushimi Inari is an ancient Shinto shrine that predates Kyoto’s capital status in 794, it is one of thousands that are dedicated to Inari, the Rice God. When you first enter, the main shrine building is right in front of you. 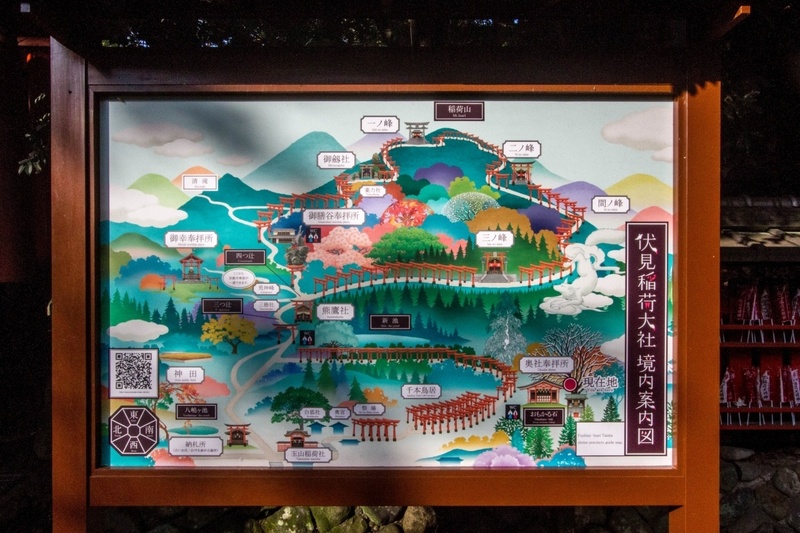 Don’t pass this by in a hurry to walk the mountain as it’s quite beautiful with its hard wood carvings and colorful donations and prayer symbols. Along the way, you will also notice an abundance of fox statues. The fox is considered to carry messages for the Rice God, and this is depicted by the scroll clamped between the fox’s jaws. Each fox is unique. Pro Tip: The shrine never closes, so try to go early to beat the crowds, and to have a much easier opportunity to get some great photos. There is plenty to do at and around the shrine’s nature park. 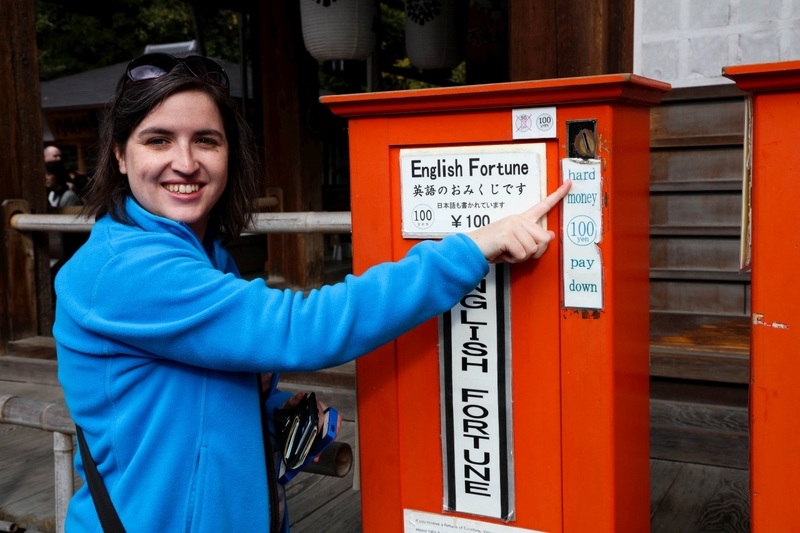 For example, you can get your fortune told by inserting a coin in one of the many orange machines. Just remember to find the English one if you want to know what it says. There are also food stands and a few restaurants along the paths that serve themed dishes, such as the abuurage, or fried tofu. This is reportedly the favorite dish of the messenger fox. For the kids: Have them count how many foxes they’ve found. Can they identify what each is holding in its mouth? 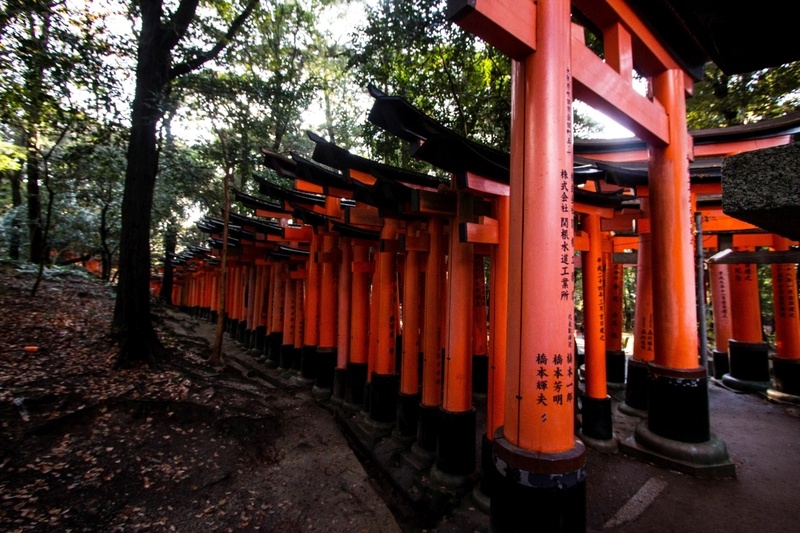 The highlight of a visit to Fushimi Inari Shrine is when you are following the path through the woods, passing by many stone Japanese lanterns, and you come to the Senbon Torii or Thousands of Gates. 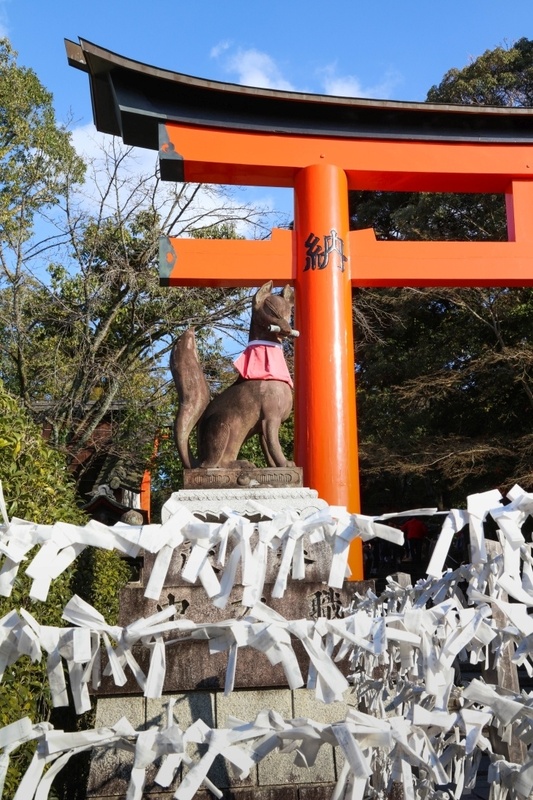 First, you will notice a couple of stands selling tokens and tiny torii gates or fox heads for you to write your wishes on and hang for them to come true, then you will enter the covered paths. Thousands of donated torii gates were offered to cover the paths, which is what the black painting is on the leg of the gate. 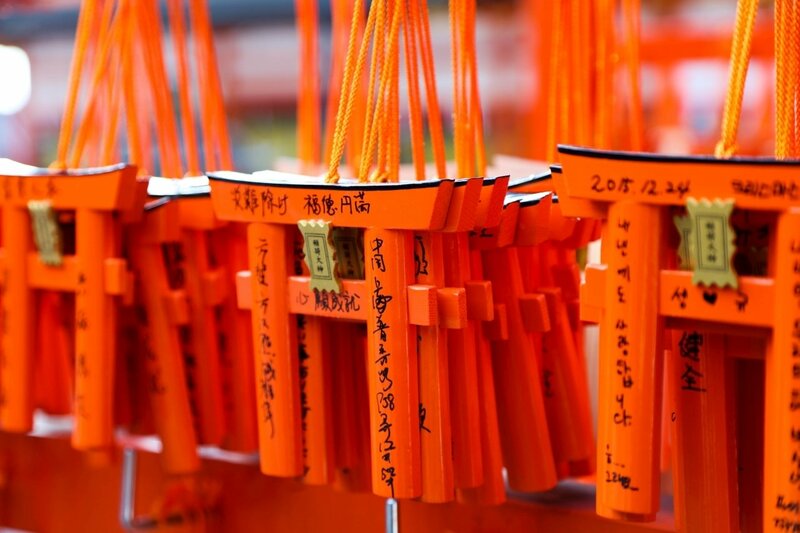 Individuals and corporations donate the gates that form the trail in an effort to bring luck and prosperity for the future. 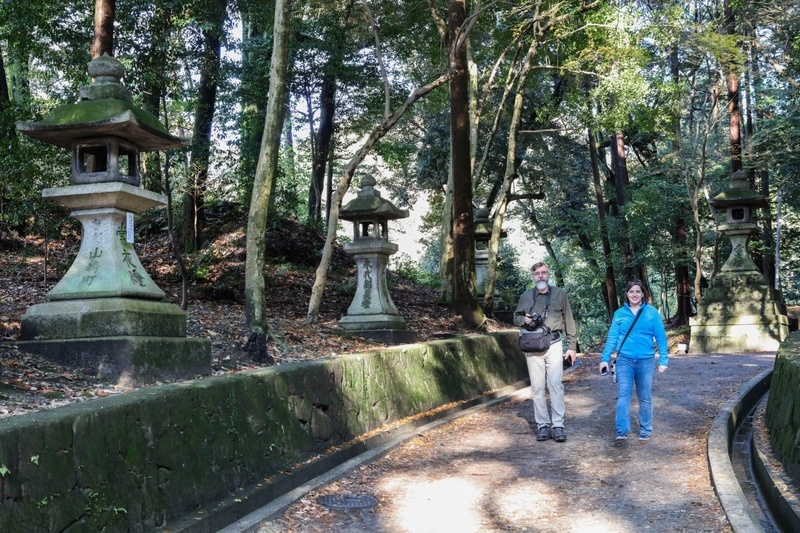 Getting to Senbon Torii – By car: As usual, we drove so we just put in the address to our GPS. The address is 68 Fukakusa Yabunouchicho, Kyoto. By Train: Many shinkansen, fast trains, go to Kyoto. Once in Kyoto take the Nara line t0 Inari station. The Fushimi Inari Shrine is short walk from the station. Days and Hours: The shrine never closes. I haven’t been at night, but many people say it’s gorgeous. Bring a flashlight with you when you go. 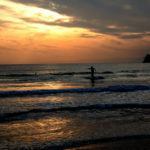 Where to stay: You could try a capsule hotel for a real Japanese experience, or opt for a comfortable, good value budget hotel. Both of these choices are near the main station and well placed for getting around Kyoto, the city of temples and shrines. Water: Especially during the summer months, don’t forget to bring water, even though there are plenty of opportunities to pick up a local drink and a snack along the way. Little ones: The hikes are up and down and around, and depending on the time of day can be quite crowded. Leave the stroller at the hotel and carry the baby. 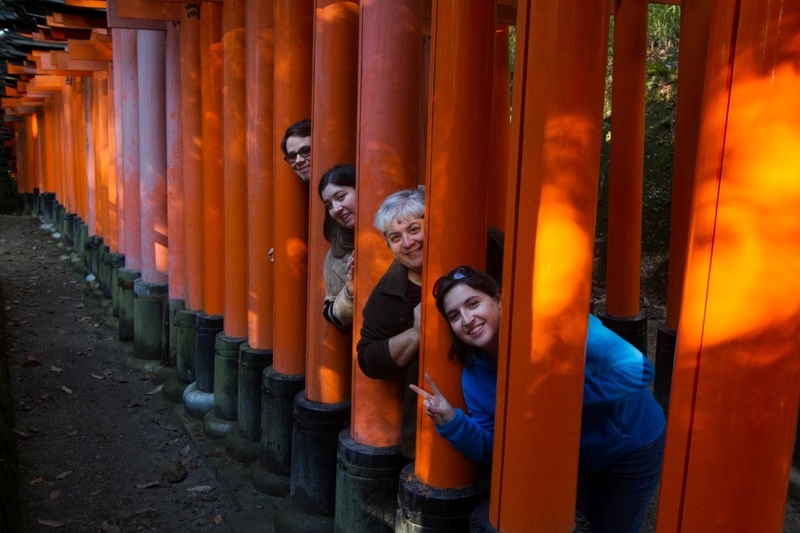 Photo: You will want to get a good photograph of yourself and your travel partners. 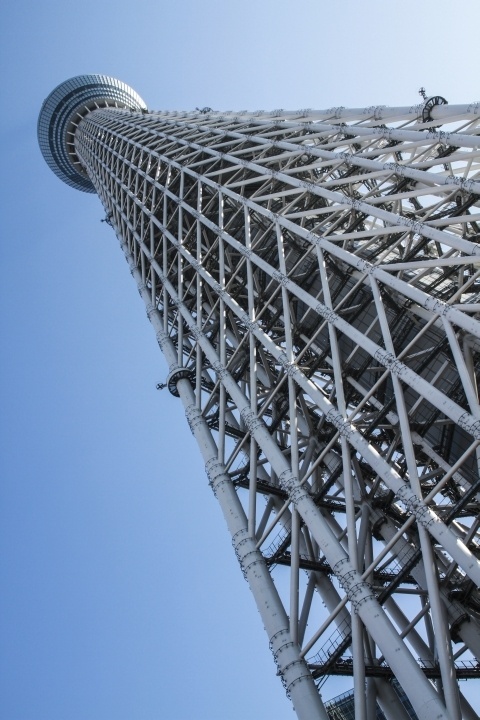 In Japan it’s no problem to ask someone to take a photo for you. Just remember to return the favor. However, if you are shy, bring a tripod! Pin the Fushimi Inari Shrine Kyoto for later. It’s still on my bucket list, I always wanted to go there but because of work I’ve never made it (yet)! I’m hoping I can plan a trip for next year. 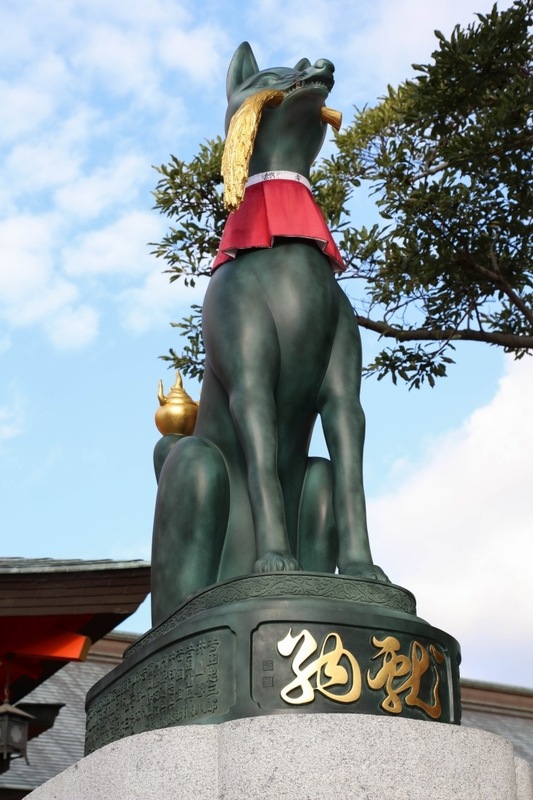 Shrines and Japanese culture fascinate me a lot! 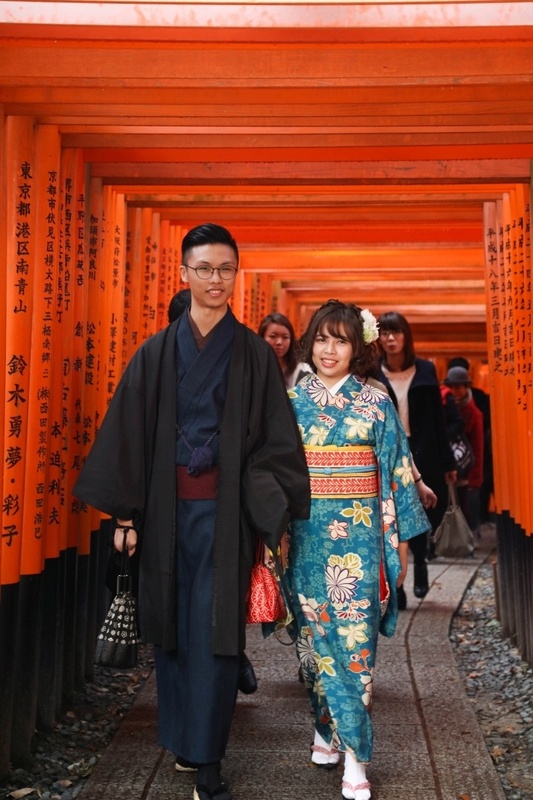 I also loved the couple with their kimono! Dany, It’a great spot for photographs, but it’s also a great spot for peace and a nice walk. I hope you are able to get there soon. I have not been to Japan yet. This shrine is intriguing. I love the contrast between the orange and black gates and the natural green forest background. The directions on the English fortune machine are amusing. Rhonda, I know, I love Japanese translations into English. It’s always fun. 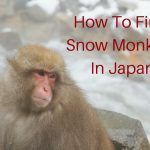 Put this one down for when you travel to Japan! Ahh there’s nothing I love more than something free AND amazing!! This seems like the perfect way to enjoy the culture of Japan, but also enjoy yourself while doing it! I’d probably try and stay in a capsule hotel to get the real experience! Where did you stay? Tarah, I’m with you. I love going to something free and really enjoying it. I’ve seen many pictures of this shrine, but did not know that it runs all the way up a trail! The walk must be lovely. This is definitely a place I would like to see for myself. Punita, I think you will thoroughly enjoy it; it’s so peaceful. Go! Danik, It’s a gorgeous place to go. You will love it. Beautiful pictures. Sounds busy it makes sense to get there early as you advise. I haven’t been to Japan but the more I read about it the more intrigued by the country I become. Thank you! It is a unique country indeed. Highly recommended. I’ve seen so many great photos from this place already! Someday *fingers crossed* I might see that with my own eyes too! Can’t wait! Viki, I have no doubt that one day you will get there! Looks like a beautiful place to explore. I like that it is always open. I can imagine that a really early morning walk through here would be super peaceful. Brianna, Yes, isn’t it a bonus? So beautiful! I have never been to Japan but I would really love to visit one day. This temple seems like it would be an interesting day trip to check out. Nathan, I have do doubt you will get here one day. It’s gorgeous. I am not fan of Japan or Japanese culture but this is a place I would like to see by myself, such great photo opportunities! Elisa, It is a pretty place, a nice mix of traditional and parkland.